Your favorite band has just announced their nationwide tour. Should you pay to join their fan club and get in on the pre-sale? No, you decide to wait. But the on-sale date arrives, and the site is jammed. You can’t get on—and the concert is sold out in six minutes. What happened? What now? Music journalists Dean Budnick and Josh Baron chronicle the behind-the-scenes history of the modern concert industry. 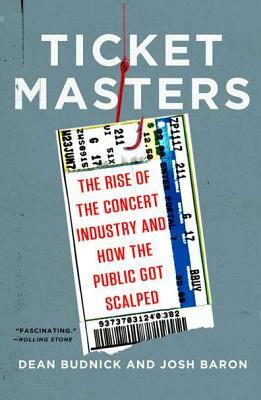 Filled with entertaining rock-and-roll anecdotes about The Rolling Stones, The Grateful Dead, Pearl Jam, and more—and charting the emergence of players like Ticketmaster, StubHub, Live Nation, and Outbox—Ticket Masters will transfix every concertgoer who wonders just where the price of admission really goes. This edition has an updated epilogue that covers recent industry developments. Dean Budnick is the executive editor of Relix magazine and the founder of Jambands.com. He holds a Ph.D. from Harvard and a J.D. from Columbia Law School. Josh Baron is the editor in chief of Relix magazine and contributes to a variety of media outlets including New York City–based radio station WPUV, where he serves as a music reviewer.